War and Politics are topics that, Anime as a medium rarely dives into, and for good reason. A story centered around war and politics is something that is sure to put off people by its very nature, for one. For two, its really hard to craft an engaging and exciting story around such topics anyway. To that end, 2017’s Shoukoku no Altair (Altair a Record of Battles in the west) doesn’t fully succeed at conquering this particularly difficult area, but man, does it come as close as I think any series ever has or probably will. 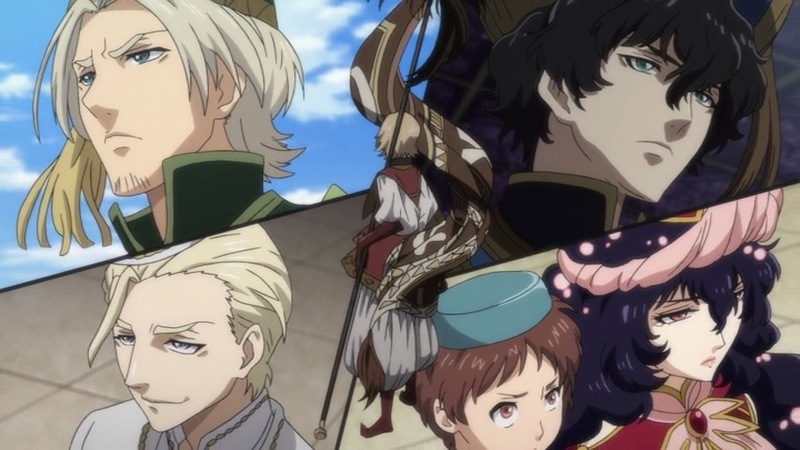 We’ve seen other notable series try to include a political or war based element in their stories, be it 2012’s Kingdom or the more recent Arslan Senki. Each of those, however, have always used the politics and the idea of war as more of a backdrop, a setting to tell a more personal story about a central character or certain group. 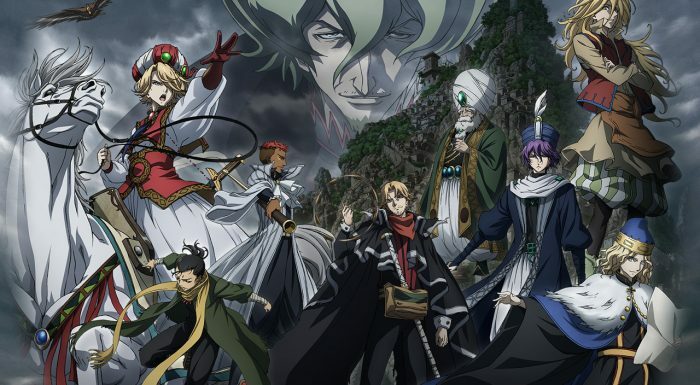 What’s so notable about Shoukoku no Altair then, is that it kind of flips the script here, using excellent and endearing characters to tell a tale that actually focuses in on the politics and the idea of war itself. At the center of it all is a young man named Mahmut. Mahmut is a pasha, a military leader part of the “Divan” (A collective military parliament of sorts) of the fictional country of Torquey. And Torquey? Well, as we start of the series the country is seemingly in a precarious condition of imminent war with a much bigger and more conquest hungry empire called Balt-Rein. The countries have actually gone to war before, with Torquey having staved off the first invasion a few years prior. And it was in that very battle, that Mahmut’s homeland and family were destroyed, cementing his road to becoming a Pasha and ultimately wanting to prevent the horrors of war from ever happening again. What makes Mahmut so interesting, and therefore the series in turn, is that this is a character who’s a military man, that hates war. He hates war, and his goal throughout the series is to prevent it, at all costs, knowing full well what horrors it brings. 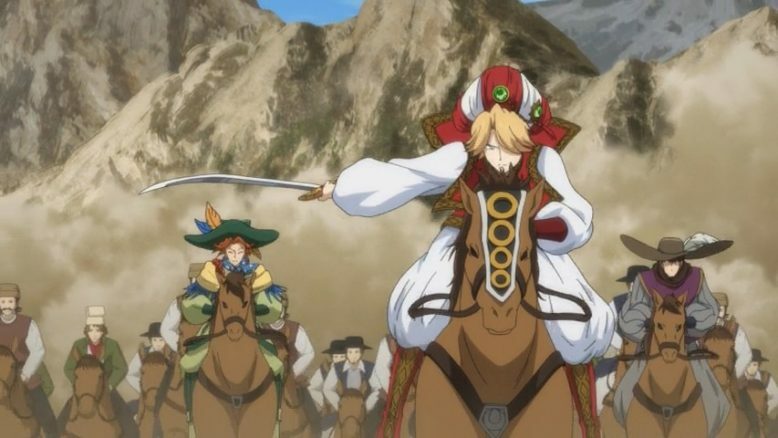 But its Mahmut’s skill as a general and a diplomat, learned for the art of war, that serve as his major tools. So yes, the series then basically consists of Mahmut making various political moves and maneuvers to try and convince various cities and states to ally with him and deter the empire from waging full out war. Its an interesting concept, particularly because the series never shies away from the idea that war is inevitable and that Mahmut’s pursuit, however noble, is ultimately going to result in failure. Plus, there’s the inherent contradiction of Mahmut being a military man (and not a flat out politician) and yet wanting peace. Throughout the series, the show actually uses its interesting main character and his journey to explore different types of commerce, economy and the politics that revolve around this so called war. And make no mistake, this is a war and the show actually does feature quite a few battles that focus on military strategy and combat of large armies just as much as it does the politics and diplomacy. 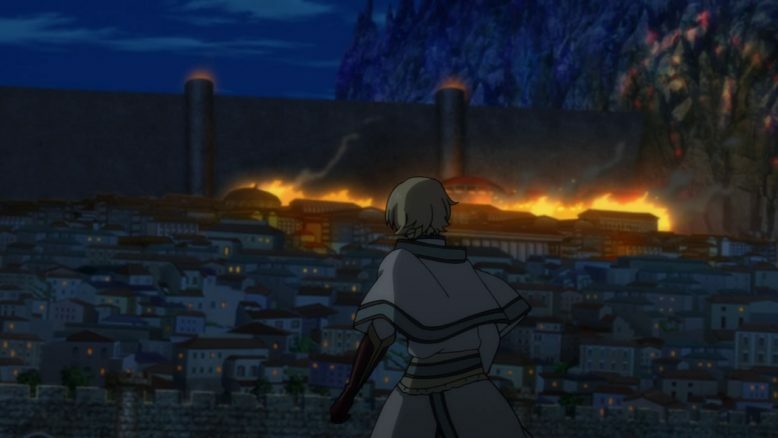 There are smaller battles that are based around the locale that Mahmut is in, at any given time, but two larger, full scale wars also happen, by the end of the series. 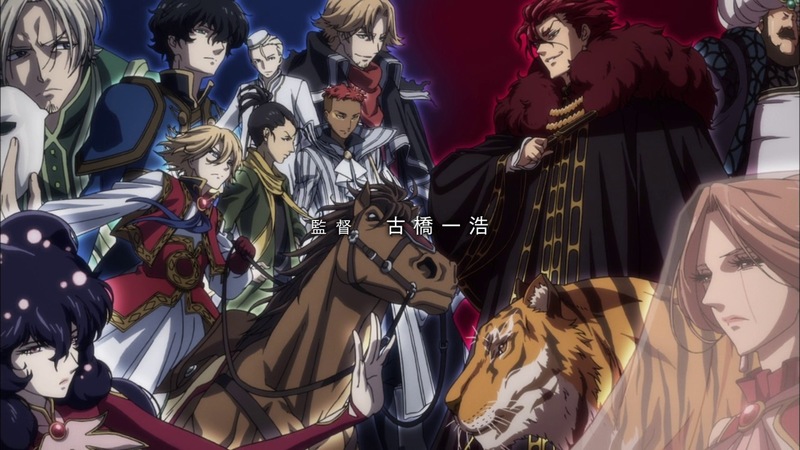 Each of the two major wars cap one half of the series, and its in these two halves, I think, that the smaller issues regarding Shoukoku no Altair become a bit apparent. Simply put, the biggest issue with this series is in the pacing of its story. Shoukoku no Altair starts of with a really rushed and hard to engage with start to its story. Mahmut’s first escapade, introduction and origin story, are all kind of jumbled into the first two episodes, and the results are very off putting to say the least. I’m sure that many viewers of the show, while it was airing, dropped the show there and then. Those two episodes are jarring, in that they breeze through a rather intricate and well thought out set of events that require time and careful setup to actually be satisfying. 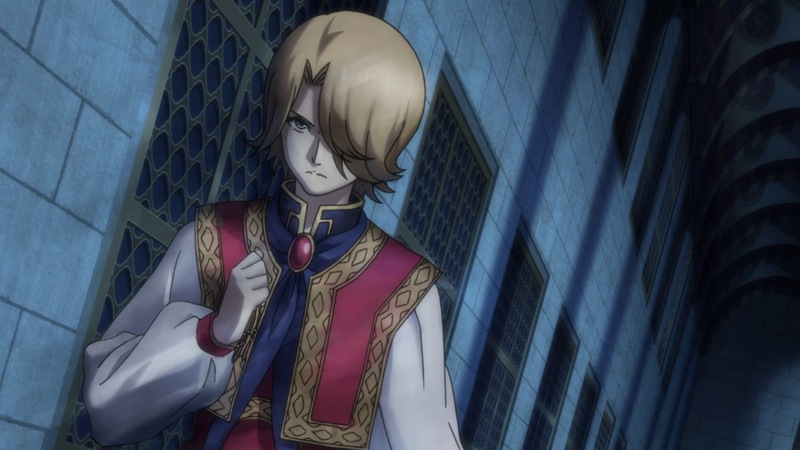 By episode three, due to certain events in the story, Mahmut is put into a very interesting and vulnerable place, necessitating that he travel around the area outside his country and get a lay of the land. Its in this journey, which takes up the first half of the series, that Mahmut gathers a bunch of companions and begins his activities to ultimately prevent war between his own country and the much hated Balt-Rein empire. The surrounding smaller countries that Mahmut visits are under threat themselves, but each has its own culture, way of doing things and systems of operation that need to be navigated around. The resulting story, past the first few episodes, is a really endearing one. Its by that point that Mahmut kind of proves his worth as a character and protagonist, and its also then, that he gains a cast of characters that he can play off of. Characters like Suleyman Bey, Zaganos Pasha, Cyrus and Abriga make the story a lot more interesting when they actually all come upon the stage, as the series heads towards the conclusion of its first half. The story to get to the point where Mahmut has a band of friends around him is a slow one, and an interesting one, but its ultimately the second half of the series where things really kick into high gear. 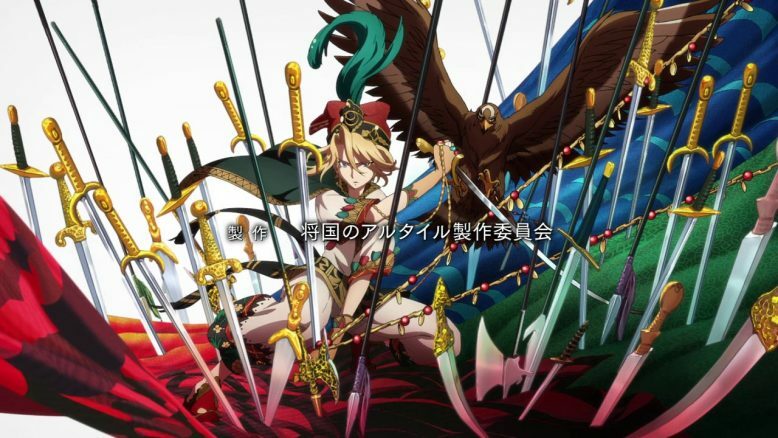 That second half of the series, is where the show has more or less established the greater conflict that Mahmut has to deal with, and given him a band of companions to help him in his mission. Here the show focuses less on establishing dynamics and characters, and more fully on having Mahmut and his group go to work. Its here where the characters really begin to function as a unit, and Mahmut himself emerges as a more capable and confident leader. Thus the second half of the show, is really the entire premise and the idea of this show, firing on full cylinders. The focus is on the politics and on the exploration of how it all works in a really practical and interesting sense. Rarely is this just a show about logic, and it features some great depiction of different cultures, societies and egos all clashing together under the threat of a great war. Until the last episode, the events of the story are truly engaging and gripping, with one of the show’s best story arcs to date, concluding quite aptly. No, the show doesn’t conclude the entire ongoing epic story of the franchise in it’s 24 episode run, but it does stop at a decent enough of a stopping point, at least. Which, incidentally, is probably the best you can hope for with regards to an adaptation of an ongoing manga. The problem of an inconclusive ending is still, however, a bit of a problem. 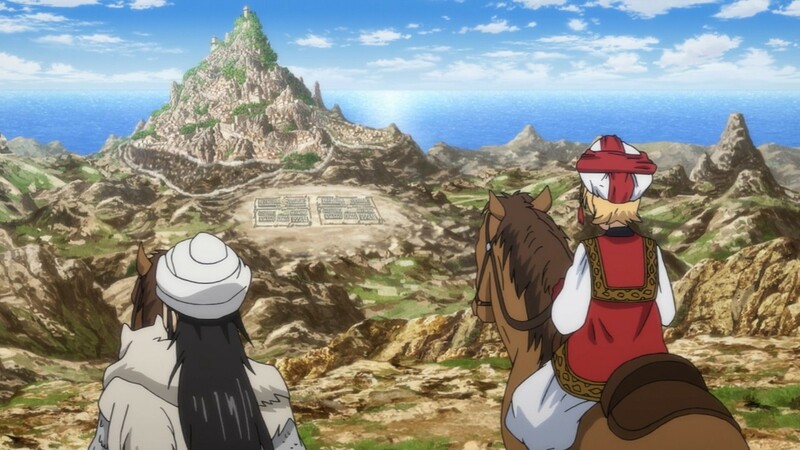 Much like the two other series I mentioned earlier (Kingdom and Arslan Senki) leave things unfinished with no indication of a sequel in sight, so too does Shoukoku no Altair. I’m not really sure what one can really do about that particular problem, as its something that’s more indicative of the current climate of the Anime industry itself, rather than this specific series. In the end, all you can really evaluate is the story that IS present. That story, is ultimately rewarding and entertaining to follow, even if the series itself is nothing more than a 24 episode commercial for its source manga. So… Solid story revolving around politics and war that isn’t for everyone due to its very nature aside, what other issues are there with Shoukoku no Altair? Well, another issue I think, is that fact that despite its rather deep focus on both politics and war, the story as a whole does beg for a pretty decent amount of suspension of disbelief at times. There’s a big element of luck and coincidence in some of the eventualities that result in each of the story’s smaller moments. Mahmut succeeds sometimes because the stars do really align for him, rather than by his own power as the series would have you believe. The series also juggles a lot of interesting concepts and ideologies of different kinds of societies, but never really spends the time to really explain or fully explore one particular idea. We get short visits to some different kind of countries, some that rely on their historical pact with other countries, some that focus primarily on trade, some that are isolationist countries by tradition e.t.c. What’s problematic here, is that the show breezes through each idea it presents, in an effort to keep the ongoing conflict between Tourquey and the Balt-Rein empire, going. To that end, there’s always a sense that Mahmut, no matter what he does, is going to be unable to prevent war. The show has to have Mahmut make some progress, but he can’t basically alter the fictional history that is more or less set in stone here. This creates a story that feels a bit fatalistic at times, and makes Mahmut seem like more of a naive idealist that he probably needs to be. The final issue, and its a pretty notable one, is the fact that the antagonists of the series, The Balt-Rein empire and a minister called Louis, are hardly developed to a degree that makes them into proper antagonists. 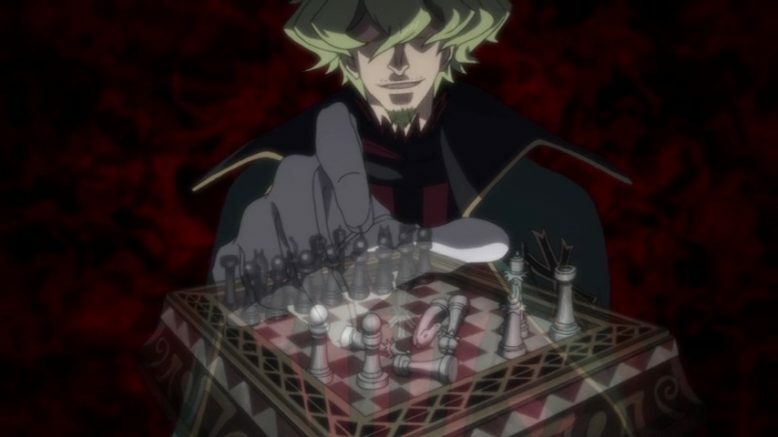 The empire itself, and any of the players inside it, some of which actually come head to head with Mahmut himself, are never really elaborated on too much. While the story takes great pains to explore the backstory and character of any of the characters that the Empire is attacking, it doesn’t really spend much time focusing in on the empire itself. Which is a darn shame, because its only near the end, that the show slowly starts to peel away that particular curtain, and the results are immediately noticeable. The reasoning behind the Empire’s pursuits, which are only briefly touched upon in the middle of the series and then finally elaborated upon near the end, is pretty well thought out as a whole. 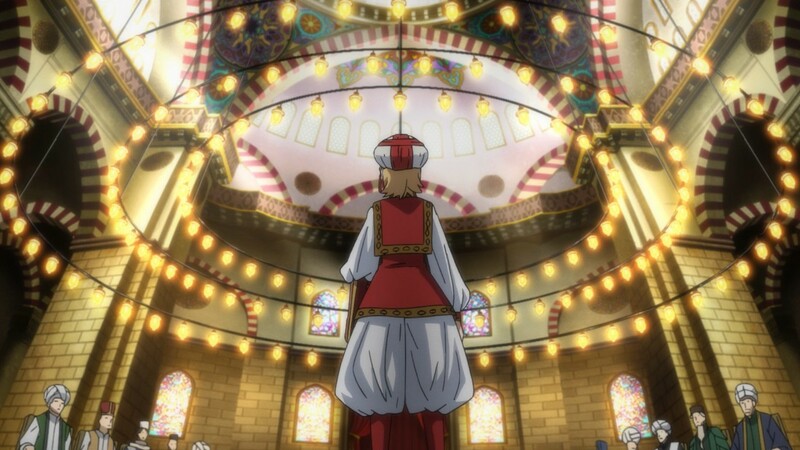 The fact that the audience doesn’t see or hear of it till the end, however, creates a pretty gaping hole in the overall story’s power and ability to really have the audience invest in Mahmut’s mission. Thus, the viewer is told to hate the Empire because the empire is attacking people, and to hate the characters that come from the empire because they’re spurring on the war. The problem with that, of course, as any veteran consumer of entertainment will tell you, is that that simply isn’t enough. Villains and antagonists much like protagonists and heroes, need to be properly developed, with their motivations shown, for them to be truly effective. Its something that the series does ultimately do a serviceable job of, but it definitely happens way too late for comfort. Finally, I think its worth talking about the show’s animation, art direction and general production values. In essence, the show is really really well done on a technical level, with animation studio MAPPA once again cementing itself as a studio that delivers real quality. This is a show that’s beautiful to look at, with a variety of locals depicted with real artistry. The show leverages culture, architecture and artistic tone from places like Europe, the Middle East and Eastern Asia, and integrates them all into a fictional world that feels consistent, believable and engaging. The show does an excellent job of depicting a variety of moments and scenes of various scale as well. Whether its a more quiet moment between two characters or a large scale war between two huge opposing armies, the show never buckles under the weight of whatever it its trying to show. The art direction and animation remain consistently superb throughout, and the biggest compliment I can give is that they service the story in such a way, that you are never, ever, brought out of the experience. There’s a reason that the majority of this review has focused on story, and its because the animation and art direction are so well done that they ALLOW the viewer to really focus in on the story and characters. Beyond that, the soundtrack and voice acting are equally excellent. The show has a really interesting mix of European and Eatern Asian tunes that generally create a real unique identity for the story and world as whole. The Opening and Ending themes are a little bit more mixed, with an odd choice of some more heavy metal music for certain ones feeling a bit disjointed from the rest of the show itself. The performances from the seiyuu, on the other hand, are all stellar, with every character commanding a presence and life to them that the story requires. Every character feels believable, whether in the fact that they maintain close to the sort of archtype that they may be perceived as, or as real people, the performances all just add something special to the whole mix. The voice acting is, one again, something that’s easy to take for granted in a series like this, where the viewer is able to really focus in on the larger story that the series is trying to tell. 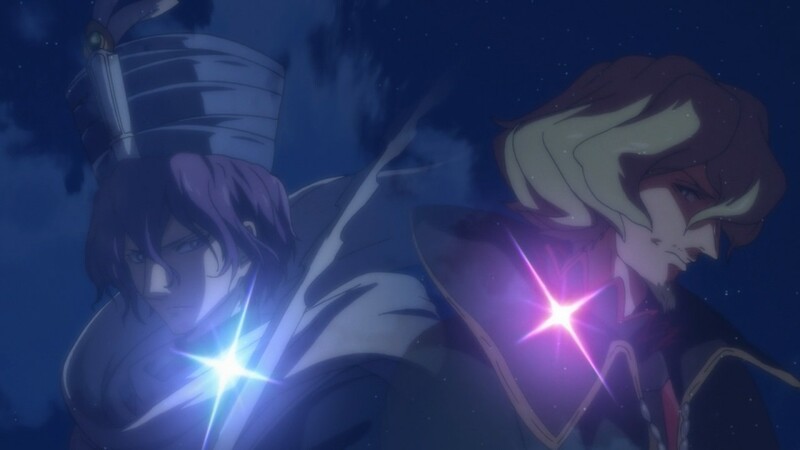 So… With all that said, how is Shoukoku no Altair as a series? Well… I’d say its a pretty good series albeit one that isn’t without its problems. The show tackles a very unique and difficult subject matter, and really goes all in on it, which is definitely something worth noting and appreciating. There’s the fact that shows like Shoukoku no Altair are a real rarity in Anime as a whole, and even with some similar series available, there really isn’t anything quite like this particular show. The fact that the show focuses on war and the politics around it, makes it ultimately a show that’s going to appeal to a very specific kind of viewer. 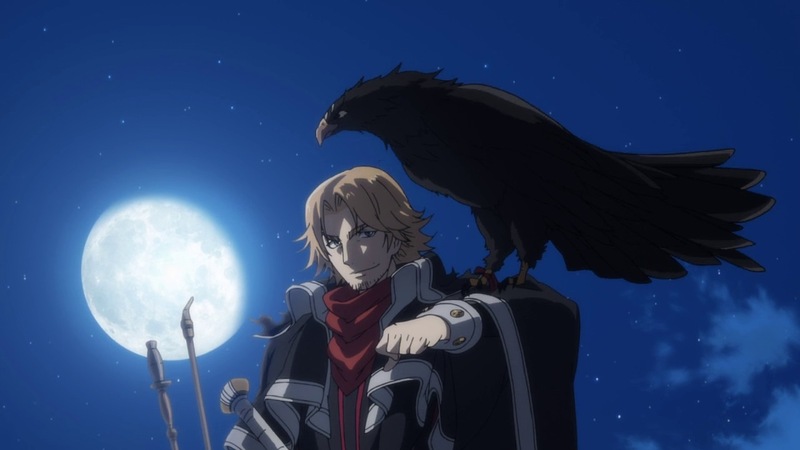 If you’re someone who enjoys solid dialogue, and games of wit between characters, with a little dose of grand scale action here and there, then Shoukoku no Altair will be an absolutely riveting experience that will consistently reward the time and patience you put into it. For everyone else? Shokouko no Altair will be a bit of a harder sell. Regardless, looking at it for what it does pretty darn well, its easy to award it the A Grade that it very much deserves.